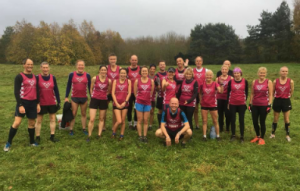 This is a Cross Country league run through the winter months at various locations through Norfolk and Suffolk, originating as a forces league with events at various Army and RAF bases. This league has now expanded to include local and domestic running clubs throughout Norfolk and Suffolk. The league series is open as team and individual races. The series consists of ten races per season. For individuals 2 races per season can be dropped to be eligible to participate in the awards for the season, team results require all 10 races. Please ensure that you have read and understood the declaration and disclaimer below so that the organisers understand that all runners participate at their own risk. Men’s races are generally 10k and the ladies are approx 5k, this does vary according to location. All races start at 2:30pm with race briefings at around 2.20pm. By reading this disclaimer all WAC participants entering the EACCL races do so entirely at their own risk. EACCL, Sponsors, Team organisers, venue owner or Helpers take no liability for any injury, loss or incident resulting from these races. WAC have signed the team sheet and paid the entry fees which is acceptance of these conditions for all runners participating as part of the WAC Men’s and Ladies teams. EACCL Winter series dates so far are here. For full details of races, venues etc please see the EACCL website or visit the EACCL Facebook page. Please come ready to run (no facilities) start time is 10am. Entry on the day only. Cost is usually around £4.00 per race. For further details of any of the cross country events please speak to our club xc organiser Tony Beales.